Slade has gorgeous liver markings, a perfect topline and tailset and lovely movement. His huggy temperament certainly comes from dad Marlin, but his attitude and drive come from mom Stevie. DCA 2006 was good to Slade. He was Best in Sweepstakes, following in mom's DCA 2003 pawprints, under Breeder Judge Dawn Mauel, and Reserve Winners Dog, following in dad's DCA 2005 pawprints, under Breeder Judge Ed Petit. 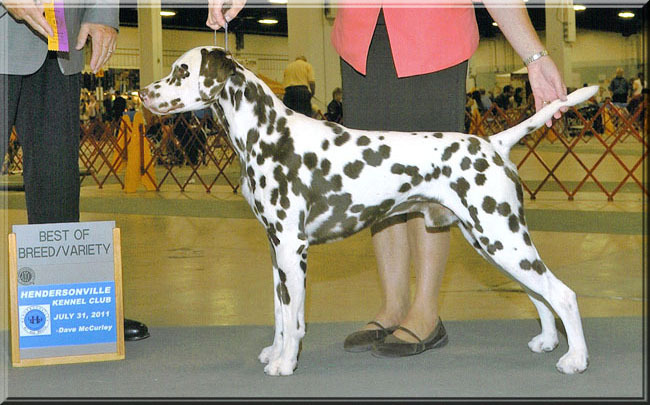 Notable wins include 2 BOB wins from the classes, one over specials, and a BISS win at the Dalmatian Club of the Piedmont from the 9-12 month puppy class, for a 4 point major. 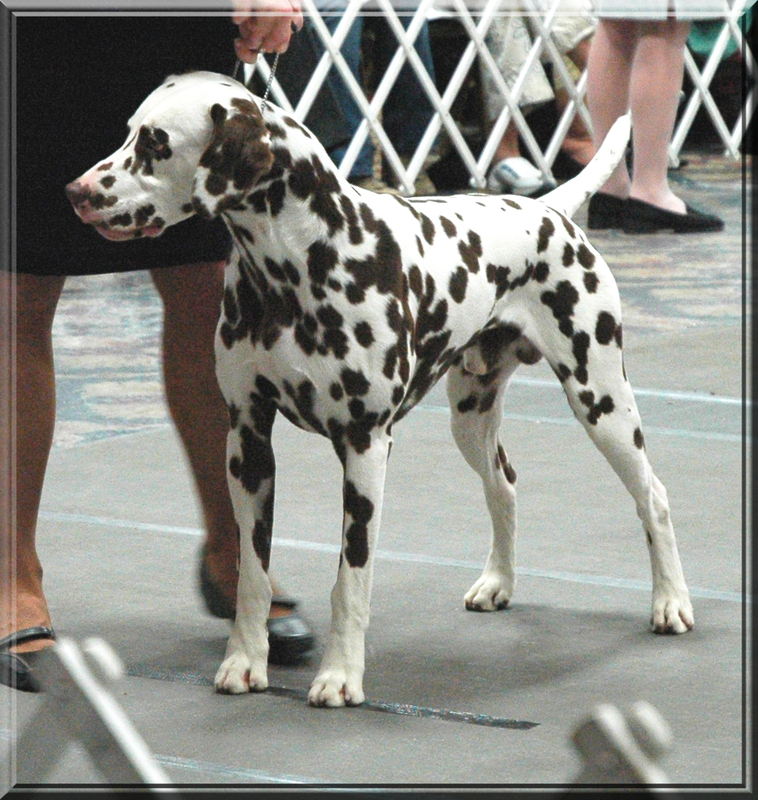 Slade finished his championship at just under a year old at the Greater Pittsburgh Dalmatian Club specialty 6/23/06. Slade has been shown very sparingly as a special since finishing his championship. He has earned a number of breed wins, a Group 4, and an Award of Merit at DCA 2007. Slade was dusted off and brought out of retirement at the Greenville, SC cluster, July, 2011. He was Select dog one day and Best of Breed another. He remembered what to do after 3 years off. Good boy! 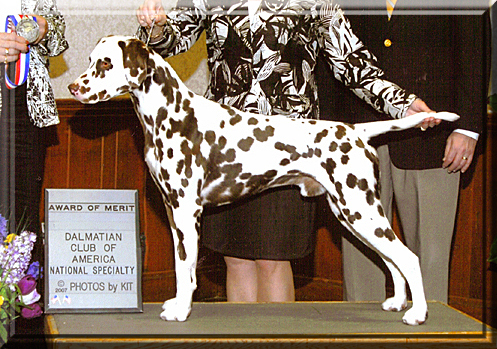 He finished his GCH in Atlanta in October, 2011. Slade became a registered therapy dog with Therapy Dogs Inc., now Alliance of Therapy Dogs, in March 2008. He visits a local nursing home and community college, rotating duties with his mom, Stevie, sister Scandal, and Scandal's kids Shane and Storm. Of 86 puppies sired by Slade, 84 are bilateral hearing and 2 are unilateral. Slade is the sire of 30 champions. 7 weeks after we lost his mom Stevie.